Primarily a combat knife is a fighting weapon. This type of knife would be used as a back-up to a sidearm or other firearm. 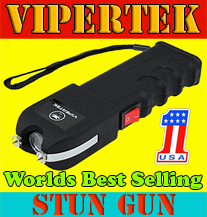 It may serve other functions though would normally be of double-edge design to allow stabbing motion and incorporate a guard to overcome grip displacement issues during use under stress. These various types of knives may incorporate a wire cutter, attachments to enable fitting to a rifle muzzle or similar weapon to be used as a bayonet and some may carry a fuller blade with strength and durability. Many come with a lanyard to assist in various operations including simple retention during movement. This knife is visually one of the most recognizable knives for any adventurer. It is easily identifiable by the typical layout of a cylindrical handle with single edge blade while sporting some sort of serration on the reverse side. The hollow handle allows the carrying of many extra tools to provide a variety of survival options. 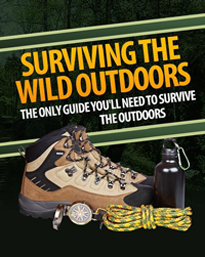 Inside you may find fishing gear, fire lighting tools, signalling equipment and even water purifying tablets. They can also carry a very useful compass inside the handle. A special response, urban law enforcement or SWAT agent may carry a duty knife to perform there day to day job. While this may seemingly be a limited use knife, it may encounter multi-purpose situations. It need not be a bold statement of their tactical gear, but rather just a flowing part of a complete uniform. A guard would be recommended due to its non-specific nature or use plus possibly the users limited abilities with a blade. Special Ops or Black Ops knives are highly mission specific. The user is thoroughly trained in the knives specific design and application. Mainly used as a fighting knife as opposed to a utility or multi-purpose type blade. 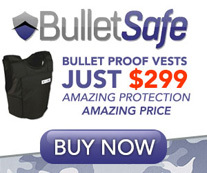 They usually do not carry a guard and are sleek, sharp and very strong with a full tang. A Special Ops soldier undertakes a mission for a specific purpose often placing themselves directly in harm’s way to get the job done so cannot let their equipment fail them for any reason. These knives may come as a double-edged blade type, typically known as a dagger for stabbing motions or a single-edge blade more for slicing actions depending on the tip shape. Compact and reliable - Undertaking recognisance missions requires stealth and invisibility. The purpose is to get in, assess the situation to either return later or call in firepower support. Remaining undetectable may require silently disabling enemy centuries with a strong, sharp blade - the recon knife. This is usually done by inserting the blade into specific locations on the anatomy known to render someone incapacitated in the shortest possible time. Recon knives for sale are specialized tools, purpose made of the highest quality materials available. Typically a larger blade required for the stronger bodies of animals. It may serve various purposes such as the initial kill, attached to a stick to become a spear, to finish off a wounded animal, or even to skin and dismember a fresh kill. Hunting knives for sale become more of a personal choice depending on your preferred choice of use. A guard is optional but recommended to assist in handling and avoid the hand slipping down to the blade in certain circumstances. Swiss army knife or similar folding knife is a great multi-purpose knife not for any specific purpose, though has many uses. This type of knife is great to throw in the car, hiking pack or your pocket when ever out and about or during adventure sports. While knives are not typically legal to carry around in an urban type situation, a Swiss army knife is less likely to be seen as a weapon. As a minimum, this is the knife you should carry when finding yourself venturing into a remote area. Have you ever heard of the man that had to cut his arm off to survival?? 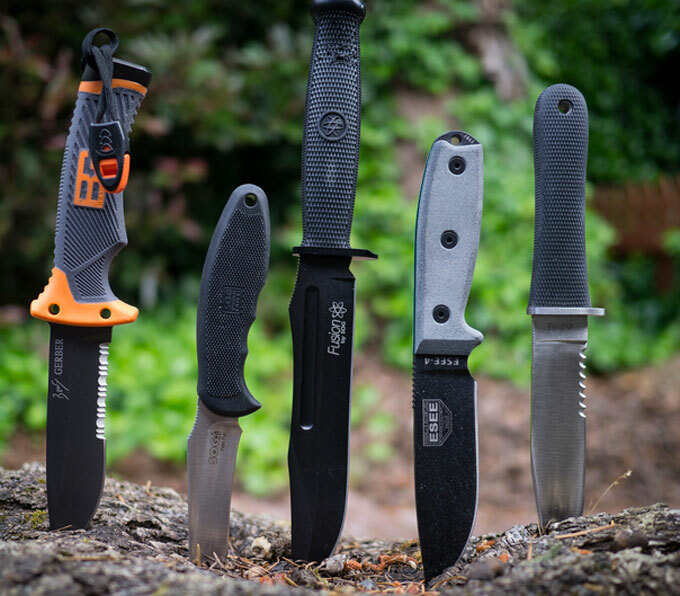 In addition to the many types of knife available, there also numerous styles in each range that can encompass such features as folding knife blades, fixed blade knives, skeleton handle, sheathed, double edge, single edge, dagger style, shooting knives or ballistic knives, serrated edge blades, full tang handles, sliding blade, flick knife, spring loaded, guarded and unguarded. They are also avaiable in many different grades of materials including carbon steel, ceramic and stainless steel. This also applies to the fixed blade knife handle construction. They can be of wood, metal, wrapped cord, plastic, composite materials, aluminum, rubber, micarta, leather and kevlar reinforced designs. The handle is the single most important part of any knife design for if you can't hold it studily and securely, it will not adequetly perform it's duty no matter what the skill of it's user. Choosing a slipery metal handle would not be suitable in a wet environment, neither would choosing a wooden handle which could swell and split when water is absorbed. 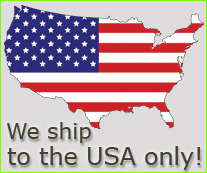 While there are some world reknowned fixed blade knife brands available such as Gerber, TOPS, Cold Steel, Spyderco, KA-BAR, Fairbairn-Sykes, Colombia River, SOG Specialty Knives, Smith Wesson, Bowie Knives, Kershaw, it is definitely not the case that they should be the only ones to consider. There are also many aftermarket and smaller company knives that will do a great job. They also come in different trademark shapes such as the Bowie, Butterfly and Tanto blade styles to name a few. A thorough evaluation by an educated user of the TOPS brand US Marine Corp combat knife. An enlightening overview of the many different aspects of your not-so-common blade. An example of how an off the shelf survival knife has been altered to suit an individuals particular needs. This is often not considered when looking for a knife and people can limit their choices by not keeping an open mind to taking a knife and personalizing it. The answer to "what is the best knife?" A real life presentation by a knife aficionado. This simple presentation will help you decide on the right blade for you. Essential viewing! Knives are typically restricted by law, although restrictions vary greatly by country or state and type of knife. For example, some laws restrict carrying fixed blade knives in public while other laws restrict private ownership of certain knives, such as switchblades. The amount of attention paid to aesthetics in preference to function in many modern-made knivesis a worrying trend. It istrue that attractive-looking knives appeal to buyers, so manufacturers and knifemakers create demands for knives that look good, but may not always perform to the user's expectations. Shortcomings in performance can be attributed to poor blade shapes, inappropriate grinds and uncomfortable grips, and even the blade steel. The basic objectivc of a blade is to cut efficiently. Commercially produced bar and sheet steel used by knife manufacturers and custom knifemakers is consistent. We know exactly the composition of the metal because steel suppliers, including those who commercially produce Damascus steels, provide a 'certificate of chemical analysis' and technical sheets, which include details for heat treatment. Professional heat treatment firms, employing sophisticated equipment such as electronically controlled vacuum furnaces, can harden and temper blades to the required specifications (Rockwell Hardness). There is little margin for error. An area of much concern relates to certain forged custom knives sold by bladesmiths at markets and shows and by mail order. We, the potential buyers, can readily see and feel if knives on offer have a practical or cosmetic priority. However, unlike factory-made and custom-made blades ground from commercially produced steel that is professionally heat treated, no 'certificate of chemical analysis' or confirmed Rockwell Hardness exists for forged steel that has been scrounged (car springs and things). Similarly, forge-welded conglomerations made up of various bits and pieces of metal (chainsaw chains and things) - attractive Damascus-type steel - carry no 'certificate of chemical analysis'. And the accuracy of these forge hardened and tempered blades can only be verified by a series of Rockwell Harness tests along the blade in close proximity to its cutting edge. 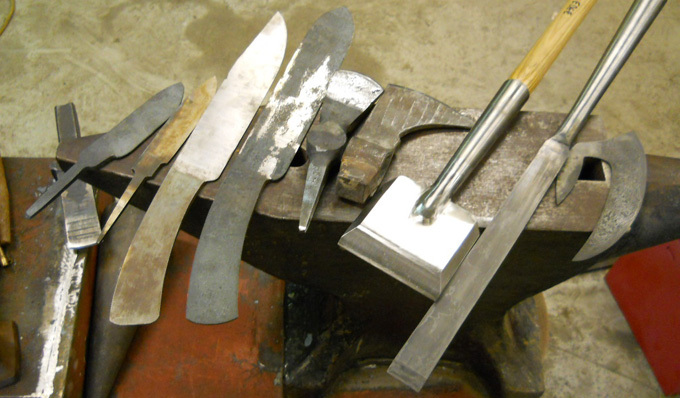 Knives made from forgeable commercial steels such as 01 tool steel, L6 saw-blade steel, 5160 spring steel and 10 seriessteels, for example, are a different proposition, although the skill and integrity of the bladesmith has to be relied upon for correct heat treatment of the bladeware. A handful of very skilled bladesmiths, mostly indentured tradesmen around the nation, have successfully experimented and tested the steels with which they've worked over a long period to ensure they deliverthe essential characteristics required for a good working knife. On occasions overthe years they've passed the knowledge on to novice bladesmithsfortunate enough to learn under a masters guidance.By this manner high standards of blade-craft are maintained and perpetuated. Not too many years ago bladesmithing techniques, including Damascus forging, were veiled in secrecy and wrapped in mystique. But these days there are umpteen 'how to' books and videos on the subject, which means hundreds of aspiring bladesmiths are blissfully banging out knives on anvils and having fun pattern-welding steel for knife blades. They learn a bit about bladesmithing and read a bit about metallurgy and network with like-minded makers and they start selling a few knives. Then, some feel compelled to begin teaching 'the art of bladesmithing' to others. But these self-appointed teachers are not tradesmen who served a blacksmithing apprenticeship. Messing around mixing metals to forge fancy-looking blades can be a dangerous practise. Nowadays, there is a glut of forged bladeware put out by part-time bladesmiths, mostly hobbyists, but it's difficult to discern which are quality blades when you've no idea how they were constructed? Obviously, it is wise to rely upon the integrity of the tried and proved bladesmiths and their colleagues, whose work standards these esteemed blade makers endorse. But, I've got to tell you I get very nervous about the direction that custom knifemaking is going when some bladesmiths openly admit that their showy, Damascus-forged blades are mainly made for collectors not users, and say they cannot guarantee the cutting efficiency of their knives. Such knives, with unusual and striking blade patterns threaten to become a new category of collectable knives. Yet many look like knives that beg to be used, so how can they be identified as beautiful but useless bladeware? A Spanish-made Aitor A022, top, A026, American made Buck 141,135, 499 and Australian designed SICUT Mintan. Called by various names, skeletal knives really are the bare bones of blade ware, devoid of handle materials and usually with cutaway sections for specific applications. 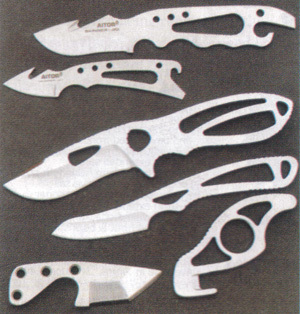 The intended purposes of a small skeletal knife are defined by each knife's profile; that is, what it looks like in silhouette. Being all-metal tools, they are not so comfortable to use in extreme climatic conditions, such as in places where you could fry an egg on a rock, or in icy-arctic conditions. At such times, it would be better to have a knife with handle scales (natural or synthetic) pressed against your skin and it isn't too difficult to fit them to your skeletal knife, if it is your desire to do so. However, to customise a skeletal knife by the permanent attachment of handle scales detracts from a prime characteristic of such a knife - that it be slender and not bulky, thereby making it easier to carry when stashed in a pocket-size survival kit or strung in a pouch around the neck or sewn into a belt knife sheath or, indeed, the belt itself. To enhance their slim grips, skeletal knives sometimes come wrapped in thin (removable) parachute-cord. Most skeletal knives come with contoured grips and tie-holes already drilled to enable the knife to be tied to a length of wood - a short, thick stick to extend the handle and provide a palm-filling grip or a long, narrow stick to reach edible bush tucker growing in the upper reaches of a tree. To use a skeletal knife attached to a stick for use as a spear is not recommended. Why risk losing or breaking a perfectly good edged tool? Instead, apply bushcraft and use the knife to make losable, abuse-able spears from appropriate lengths of bush wood. Their role as a lightweight, fixed-blade backup knife by far outweighs any short-comings small and slim skeletal bladeware may be perceived to have, particularly when compared to folding knives of the same blade length with locking devices. Pivot pins and locking mechanisms are vulnerable to clogging and breaking. We know that one knife cannot efficiently perform every cutting task. A small, practical backup knife allows the hunter/trekker/camper to carry a more robust, utilitarian belt knife. 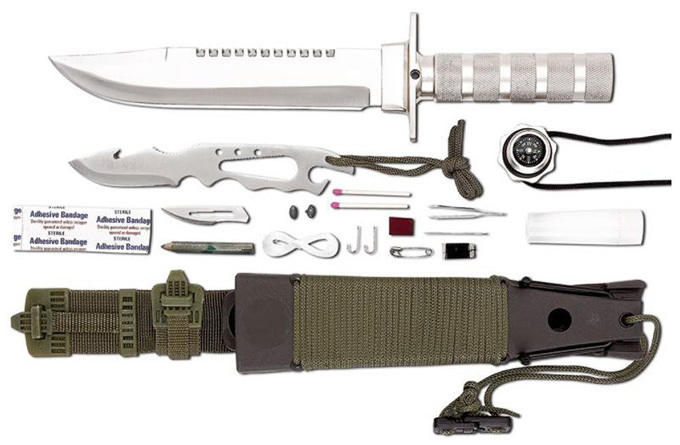 Astute American survivalists will advise outdoors exponents not to integrate a small backup blade with the belt knife-sheath combination, but to carry it elsewhere on their person. Should the belt combo somehow get lost or left behind, the backup knife survives! While we try hard not to lose valuable tools, it can happen. For example, the adverse effects of hyperthermia (extreme heat) or hypothermia (extreme cold) can cause a disoriented person to inadvertently make mistakes they ordinarily would not make, such as leaving behind precious survival items, losing them down a crack in the rocks and so on. A skeletal knife tucked safely away somewhere on the carrier will ensure that a viable option in edgeware is always on hand when moving around the great outdoors.